The third CicLAvia is upon us already, and it&apos;s bigger than ever. You&apos;ll be able to bike, walk, run, jog, skateboard, cartwheel, pogo-stick or do anything but drive through the 10 miles of the route from 10 a.m. until 3 p.m. tomorrow. EVENTS: You can download a complete guide to the events going on around the event here. There will be dodge ball, dancing, chess, furry pranksters, velcro people, photo shoots and lots and lots of live music. WALKS: Feel like walking? The organizers have added new walking tours around the route in Little Tokyo, Spring Street Promenade and Boyle Heights. For information about the tours, times and locations, check out their guide here. Metro Red/Purple Line stations at Civic Center, Pershing Square, 7th St./Metro Center, Westlake/MacArthur Park and Wilshire/Vermont are on or within three blocks of the route. On Vermont Avenue, the Metro Red Line Station at Beverly is one block east of the route, and Vermont/Santa Monica Station is less than three-fourths of a mile from the northern point of the route at Melrose and Heliotrope. The Metro Gold Line Little Tokyo/Arts District Station is one block east of the route as it passes from Downtown L.A. to Hollenbeck Park in East Los Angeles and back. Both the Mariachi Plaza and Soto Metro Gold Line Stations also are within three blocks from Hollenbeck Park. 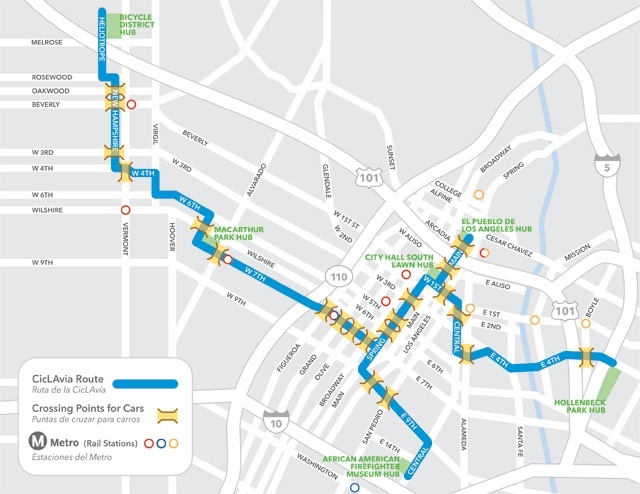 Metrolink has $10 passes for this weekend, if you&apos;re coming from afar to CicLAvia. If you do take Metrolink, you&apos;ll be in luck because they&apos;ve decided to roll out new cars with extra room for bikes just in time for CicLAvia. If you normally ride a bus through the route&apos;s area from 9 to 5 p.m., your commute is probably going to be affected. PROTEST: We wonder if CicLAvia will get a boost from the nearby Occupy Los Angeles or vice-versa. We don&apos;t see any reason why they shouldn&apos;t co-exist. CicLAvia Redux, Part 2 from Nicholas Dahmann on Vimeo. You can check out the rest of our CicLAvia coverage here.